SANTA FE SPRINGS – St. Paul High School girls basketball player Holly Shafer has chosen her college destination. 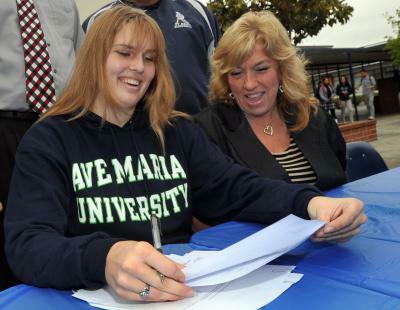 Shafer signed her national letter of intent Thursday with Ave Maria University, which is located in Florida. “I like the team and the atmosphere,” Shafer said of Ave Maria. “It’s a really new school and I get to be a part of something that is growing. Shafer said she would like to major in biochemistry. Shafer, who plays power forward, averaged 14 points and eight rebounds last season in helping the Swordsmen reach the CIF-Southern Section Division 4A semifinals. She expressed high hopes about the team’s prospects for this season. St. Paul is playing in the Leon Davis Classic Tournament, which is being hosted by Whittier Christian. The Swordsmen are scheduled to face the host Heralds at 7:30 p.m. today. WHITTIER – La Mirada High School opened its boys basketball season in superb fashion Wednesday by defeating La Serna 72-44 in a nonleague game. Taelin Webb scored 30 points to pace the visiting Matadores (1-0), who held the lead from start to finish. 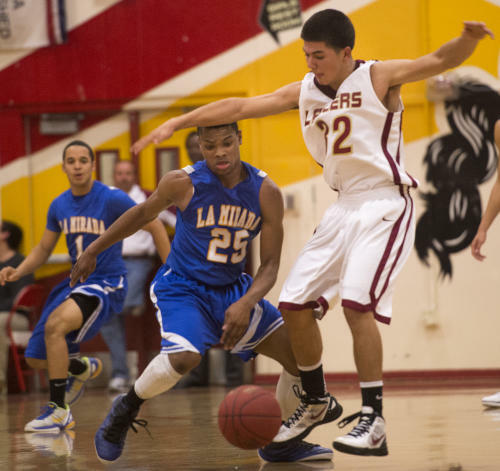 “We’re excited about this season,” La Mirada coach Bryce Jones said. “We return a lot of guys who can play. We’re very deep. The quarterfinals of the third annual Sierra Vista/Baldwin Park boys basketball tournament are set with area heavyweights Damien and Keppel squaring off today at 6 p.m. at Sierra Vista High School. The other quarterfinal at Sierra Vista matches California, which knocked off Glendora 52-49 in round-robin play, against Claremont at 7:30 p.m. The winners meet in Friday’s semifinals. Other quarterfinals tonight at Baldwin Park including Rowland against CIF-Southern Section power Thousand Oaks at 6 p.m. and Colony facing Troy at 7:30 p.m.
Damien, which defeated Azusa 89-21 and Diamond Ranch 63-51, is hoping to use the tournament to build confidence after graduating big man Chris Reyes. Santa Fe High School put together a solid 2012 season under first-year head coach David Pierson.Pierson, who took over for longtime coach Jack Mahlstede, guided the Chiefs to an 8-5 record and a CIF-Southern Section Southeast Division semifinal berth.After posting a second-place 4-1 record in the Del Rio League, the Chiefs staged an impressive postseason run by winning two games before falling to Downey 35-3 in last week’s semifinal. Downey will face La Serna in Saturday’s Southeast Division final that is scheduled for 7 p.m. at Cal State Fullerton. The Chiefs started their playoff journey with a first-round, 11-10 win over Bonita and then went on to stun top-seeded La Mirada 27-26 in the second round. Santa Fe sophomore quarterback Christian Lara emerged as the Chiefs’ main offensive weapon by passing for 1,068 yards and seven touchdowns while completing 84 of 165 attempts. Lara also led the Chiefs’ ground attack with 935 yards and nine scores on 171 carries. 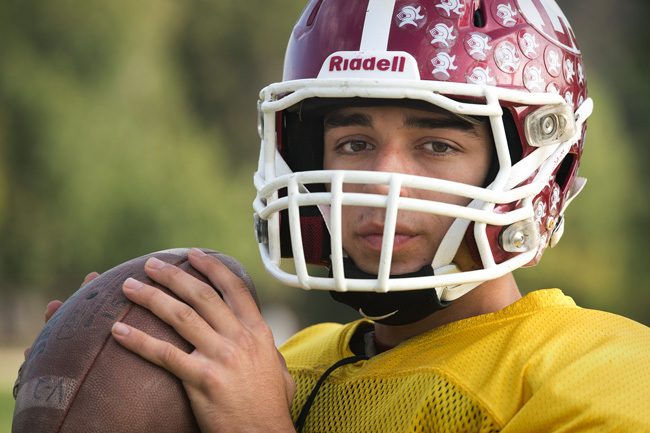 La Serna High School junior quarterback Frankie Palmer is already putting together quite a resume. Since taking over the starting duties as a sophomore last season, Palmer has guided the Lancers to two consecutive CIF-Southern Section Southeast Division championship-game appearances. Palmer and the Lancers (12-1) are preparing for Saturday’s CIF-SS Southeast Division final against Downey (10-3), which is scheduled for 7 p.m. at Cal State Fullerton. A victory would give the Lancers their first CIF-SS football crown since 1967. “It feels great,” Palmer said of the Lancers’ achievement. “Our team has worked really hard for this and we deserve it. “We have put in numerous hours of time. Our coaches have put great game plans together. We have a great group of guys who have helped us reach the final the last two years – from the seniors we had last year to the guys we have this year. Heading into the Lancers’ 35-17 semifinal triumph last week against West Covina, Palmer had thrown for 1,925 yards and 19 touchdowns while completing 60.6 percent of his attempts. Palmer has also done a good job taking care of the football, throwing only three interceptions. Palmer has also contributed to the Lancers’ ground attack, rushing for 257 yards and two scores on 79 carries.